While I know that Formula One (F1) racing takes place predominantly outside of the United States (with the exception of the once a year American Grand Prix in Indianapolis), and I am writing this piece for a site that focuses on American popular culture, I also know that I, along with millions of other Americans, follow the sport of F1 racing religiously and consider it the crème de la crème of auto racing. Thus I see it as part of our culture, and I have something to say about it here on the SportSass soapbox. Last week in the Formula One Austrian Grand Prix, Rubens Barrichello, driving for team Ferrari, led the race from start to finish, but did not win. "How might that happen?" you may ask. Well, just as he was about to cross the finish line, team Ferrari ordered him to slow down and pull over to let teammate and F1 points leader Michael Schumacher pass him for the win. Barrichello had beaten Schumacher handily and drove what was probably the race of his life. Remember, Formula One racing is one of the most popular sports in the world and is watched worldwide by many millions of fans. The drivers are from all over the world; the teams must raise upwards of a hundred million dollars to be competitive; races take place all over the world, and the fans root for teams as fanatically as they root for their national soccer teams. In other words, this race was an important moment on the international stage. Schumacher, an Austrian racing in his homeland, was the hands on favorite, yet this beloved son was booed loudly upon crossing the finish line while passing the real winner Barrichello. On the victory podium, Schumacher, embarrassed, pushed Barrichello onto the winner's spot and took second position for himself. What a coward! Take the heat if you're willing to win like a coward. Don't try to lighten the moment. This move to lessen the sting from the crowd has drawn loud criticism from fellow racers and fans from across the world. Unfortunately, it only adds one more piece of bad behavior to Schumacher's bad behavior list. It is no secret that Schumacher is not liked within the sport. Other racers have accused him of being a brat, racing dirty, and refusing to help teammates. All of these rumors have tarnished his reputation as probably the best F1 racer of all time. 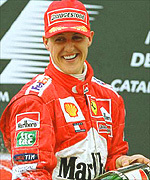 Recently, a teammate qualified ahead of Schumacher with faster lap times, so Schumacher refused to compete in the race unless he drove the faster teammate's car. He drove the faster car and won the race. In yet another instance, Schumacher ran the race leader off the road and won the race, but was stripped of all his points and suspended for a short time. ordering Barrichello to step aside to insure a Ferrarri driver is the points winner at the end of the season. Perhaps Schumacher and Ferrari are a perfect match as they'll both do just about anything to win. But at what price? They have both lost the respect of fans and drivers alike. In the end, I guess F1 racing has become as corrupted by money as American baseball and American football. So much so, that a team and a driver would deny a fellow racer his moment of glory on the international stage. Gee, I wonder if a lock out is looming in the future?